Back in the day, it was fun to watch all those Diet Coke and Mentos videos that illustrated the explosive power of this particular combination. It was innocent. It was organic. Even the fancy EepyBird-created stuff was fun. But what made it so much fun was the fact Coke thought it was a stupid idea and that they'd rather have people drink their product than use it as an entertainment ingredient. But, in yet another display of our inability to leave well enough alone, EepyBird is back. 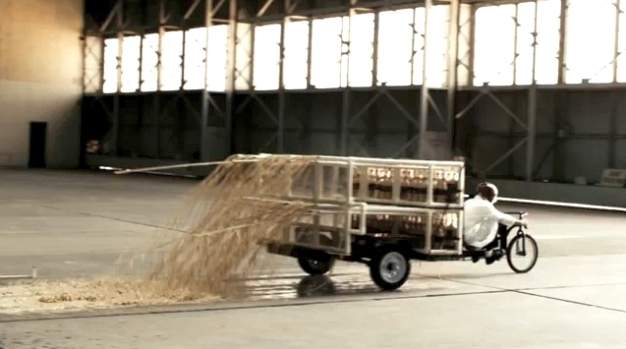 They've combined 108 two liter bottles of Coke Zero and 648 Mentos mints to propel a vehicle 221 feet. Yea. And that's really all there is to the story. Oh. Aside from the fact The Fast and the Furious director Rob Cohen directed the video. Yup. It's official. People have way too much time on their hands.